Monday Maul: Who'd want to be a referee? 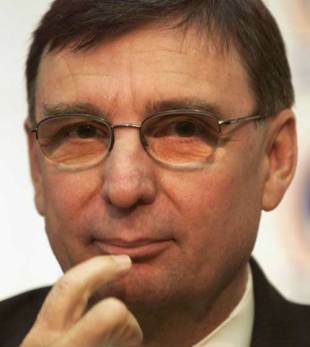 What makes David Moffett tick and what is his real agenda? Those are the questions most Welsh rugby fans and rugby clubs want answered now that he has launched his unsolicited manifesto. Why would a Yorkshireman who emigrated to Australia 40 plus years ago and returned only briefly to the UK, first to run Sport England and then the Welsh Rugby Union, before returning to New Zealand for family reasons, feel such a passion for Welsh rugby that he suddenly feels compelled to announce, "after careful consideration I have decided to return to Wales to live," and seek election as chairman of the WRU? "I have come back because I care about Welsh rugby and recent successes of the national team against European sides should not mask the deep problems the game faces," he claims. Is he just a self-promoting publicity seeker who cannot stand being out of the limelight or does he really see himself as some sort of caped crusader? "Whether you like me or not, I am a doer not a talker," he proclaims on his website. It suggests a certain personal insecurity but his track record certainly bears that out. Having also run the New South Wales Rugby Union, SANZAR, the NZRU and Australia's National Rugby League, leaving all of them in a much better place financially than when he joined them (and the same was true at the WRU) he has proved his worth but he has never stayed anywhere very long. Every time he has moved on for reasons that appear plausible but the suspicion lingers that we never knew the full story. For example, he left the WRU very abruptly in 2005 having just signed an extension to his contract when his stock could not have been higher - he had just renegotiated a crippling financial burden relating to the building of the Millennium Stadium and Wales had won a Grand Slam for the first time since the 70s. Perhaps there is a clue on his website where he has a section entitled 'About David' and the headline is 'Father, Husband, Sportsman, Traveller, Conflict Manager.' What are you trying to tell us David? Before we even start to take you seriously we need to know that you really are in this for the long term. Even if he does persuade people on that score he has an uphill task. In his manifesto - 'One Wales: Building a Sustainable Future Together' - he makes no bones about the fact that he wants to oust David Pickering as Chairman and create a new Board structure that will see Chief Executive, Roger Lewis's power reined in. First, he has to get himself elected on to the union and his only realistic chance of doing that is to stand as a national representative. He needs nominations from two clubs - I think we can presume he has already has that backing and the next election is in August. There are only three places up for grabs and they are usually hotly contested so the 15 volunteers he has already recruited are going to be very busy persuading enough of the 320 clubs to vote for him. The second stage is to stand against Pickering for the office of chairman and he sees an Extraordinary General Meeting as his best chance of success. If 32 clubs - 10% - petition for one, it has to be held within a month. His appeal to the clubs is nothing if not populist. "Either continue with the current, dictatorial, undemocratic approach which has disenfranchised the community game or adopt a system which owes much to the past when clubs had more say in the way the WRU is (sic) run." Obviously believing a little flattery never did anybody any harm he finishes with the clarion call, "Welsh clubs are special; they have been overlooked for far too long and it's time for change!" It could just work. We know the regions are very disgruntled but many clubs are also unhappy with the way the WRU is run. It is not just Moffett who sees it as being increasingly autocratic and Pickering, in particular, looks vulnerable. Thus far he has played the political game pretty well, transforming himself from team manager under Graham Henry to chairman of the WRU, chairman of the Six Nations committee and an IRB member. All those positions used to be honorary, not any more. The chairman of the WRU is well remunerated for the time spent on 'Union business' and, after more than a decade as the top elected official, there is a strong feeling in some quarters that Pickering's time is up. Moffett has cleverly suggested a maximum of two three-year terms as Chairman in his draft proposals and also advocates the CEO attending Board meetings without being a member. That also has popular support but whether Moffett is a credible successor to either is another matter. I, and many others I suspect, still need to know exactly why he has returned (he cannot say "come home again") to Wales.